First off, an explanation: For the past few months, I have been running a 1980s Fantasy Film Festival at the site, posting a review of one classic or not-so-classic from the era every Friday. You may have noticed that that series has stopped running the past few weeks, and the reason is simple–literally moments before I was supposed to be writing my review of Terry Gilliam’s Brazil, Robin Williams died, an event that hit me like a ton of bricks, as it did so many people. I have been saddened by celebrity deaths in the past but never to this extent. Robin Williams was my favorite actor. A phenomenal, truly genius talent, as well as–by all accounts–an infinitely kind person, there has been no other performer whose loss has affected me so profoundly. He has been there my entire life–outrageously funny, inestimably charming, reassuring, kind, manic, lovely. Popeye, The World According to Garp, Good Morning Vietnam, The Adventures of Baron Munchausen, Dead Poets Society, The Fisher King, Aladdin, Mrs. Doubtfire, Jumanji, The Birdcage–these are just some of the films of his that I have seen more times than I can count, some truly great works of art, others enormously entertaining, pedigree be damned. I have also loved him as Mork and as the Frog Prince in Faerie Tale Theatre, and simply as himself in his mindbogglingly brilliant stand-up specials (honestly, if you’ve never seen them, stream A Night at the Met and Live on Broadway immediately; they’re on YouTube, and you’re welcome in advance) and on Comic Relief, through which he and his friends, Whoopi Goldberg and Billy Crystal, helped raises millions of dollar for the homeless. He was a dazzling performer and by all counts an even better human being, and the fact that he’s no longer with us hurts, even weeks later. That first night, though, I was honestly inconsolable, and I knew I wouldn’t be able to focus on my writing. Instead, I felt compelled to watch what I have always considered to be one of his greatest roles, as the grown-up Peter Pan in Steven Spielberg’s Hook, a film that was largely lambasted when it first came out in 1991 but which has built a passionate, loyal following in ensuing years, largely from the young audience who, from that point on, grew up with it. When it was released, I was 10 years old, the perfect age to fall in love with it. But that isn’t the only reason I chose to watch this of all Robin Williams films on the night he died. There are many reasons, actually, which I’ll go into, but another is that the first time I saw Hook was only a few days after my grandfather, Pop Pop, died. I was extremely close to him, particularly since my mom and I lived with my grandparents, and so this was a very difficult time for me. And in order to cheer me up and get me out of the house a bit during the shiva period, a friend of my mom’s took my cousins and me to see Hook, and it completely swept me away. As Pan, Williams cheered me up and brought me joy when I lost the most important man in my young life, and so it has always been a deeply special film to me and it felt only fitting that I revisit it to commemorate Williams’ life. I’ll get back to Hook in a moment, but in regards to the film festival, the reason I haven’t picked it up again is that each night since Williams’ death, I’ve watched another one of his films, rather than the ones I’d been scheduled to watch and write on, and given how behind I am by this point, I won’t actually be able to catch up and still do all the films I’d planned. It was also, honestly, rather overly ambitious, given some other scheduling conflicts, and so I’m going to pause the festival for now and resume at a later date from the point that I stopped, perhaps during the winter TV hiatus, maybe next summer. I may even sprinkle in a review here and there when I have the chance/inclination. 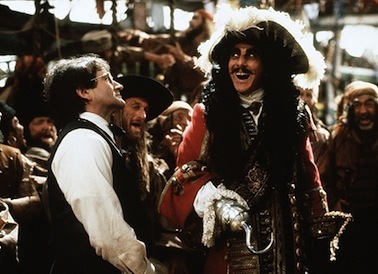 But in lieu of continuing the festival, I instead wanted to do a post on Hook, which may not technically be a 1980s fantasy but is still very much in the spirit of one, having been produced so early in the 90s, the zeitgeist was still very 80s. Often when it comes to films that I love but which critics basically depised, despite disagreeing with them, I can either understand their perspectives or can admit, yes, this is a strange film that isn’t necessarily approachable for everyone–I’m a cult film/TV fan, so I’m very used to liking things that many people don’t–but, in the case of Hook, I truly don’t see the so-called horrendous flaws that so mar it from being accepted as one of Spielberg’s classics. While even I will freely admit that it’s not his best film, it’s one of my favorites of his for numerous reasons, most of which coincide with why I selected it as the first film to revisit after we all lost Robin Williams. I can think of few filmmakers nor actors better suited to creating a Peter Pan sequel than Spielberg and Williams, respectively. Both are fascinated by childhood, innocence, and play, and have returned to these themes again and again throughout their careers, and both, despite being often accused of sentimentality, also understand the darker side of fantasy stories. Look at Spielberg fantasy films such as E.T., Close Encounters, A.I., and Jurassic Park and Williams fantasy films such as Baron Munchausen, The Fisher King, Toys, Jack, Jumanji–what they have in common are genuine scares and trauma blended with the films’ more lighthearted, uplifting elements. Similarly, Hook has its “childish” moments, such as the epic Lost Boys food fight, punctuated by their new leader, Rufio, and Peter calling each other names inspired by every sort of bodily function that kids are so obsessed with, but, like the best fairy tales, it can also be scary and eerie and sad. The original Peter Pan novel and play by J. M. Barrie was full of merriment, yes, but also genuine danger and melancholy. Although it may have seemed all fun and games on the surface, it involved young boys fighting with pirates, and these battles were not just for play. Barrie clearly indicates that these kids sometimes died in the process. Meanwhile, although a land where someone never has to grow up nor follow any parental rules may seem wonderful, there is also something very lonely about it. Never outgrowing childhood means missing out on experiences that young kids can’t possibly imagine nor comprehend, and not having parents means missing their love, guidance, and affection. The Lost Boys in the novel are so starved for a mother that they enlist Wendy for the job. And Hook understands this: that there is a price to be paid for eternal childhood in Neverland, but that there’s also a price to be paid for growing up and forgetting about it. At the start of the film, the mischievous spirit of free-spirited youth once known as Peter Pan is now a podgy, high-powered, middle-aged yuppie attorney in the US, surname Banning (a reflection of the strict, no-nonsense approach with which he treats his children), who is obsessed with work and pays little attention to his kids, even going so far as to take a cell phone call during his daughter’s school play, which just so happens to be Peter Pan–she is playing Wendy–an irony that might seem a bit on the nose but which suits the film’s fairy tale vibe perfectly (subtlety in fairy tales is not necessarily a virtue). He also has no memory of who he once was. As far as he knows, Wendy Darling, the old woman who took him in and eventually found him adoptive American parents, was simply the girl for whom the author, J.M. Barrie, crafted his whimsical stories. He hasn’t a clue that any of these magical adventures had actually happened to her and him. If “Peter Pan Syndrome” is what happens when a grown-up person refuses to accept adult responsibility, the film’s greatest irony is that the grown-up Peter Pan has the opposite of that. He has put away childish things and locked away all of his memories of them. Peter Pan has become a humorless fussbudget, which cuts “Granny Wendy” to the quick.